The energy at the Neo-Futurarium holds a lot of history for Chicago audiences and just being in a space where you’ve come to expect the unexpected generates anticipation. A Story Told in Seven Fights begins with a comic teaser fight in the lobby as the audience is waiting to be ushered into the theater. This cold open establishes the show’s major theme: the relationship between performer and performance. The show, a devised work created by Trevor Dawkins and directed by Tony Santiago, explores the explosive birth of Dadaism and its later clash with Surrealism. The throughline is an exploration of what founders contribute to a movement. The play asks: at what point does a movement become bigger than its founding vision and, perhaps also, at what point does a movement morph into something entirely different? Dawkins, as himself, speaks directly to the audience about the upheaval at Neo-Futurists. He refers to something “being taken” from the company and how the loss has inspired a revitalization. The reference is to the withdrawal of performance rights for the company’s long running signature show, Too Much Light Makes the Baby Go Blind. Seven Fights is the company’s artistic response to the very public way that offstage saga played out. The Neos have summoned a cast of historical characters to duke it out over founding myths. These include the European Dadaists founders, Tristan Czara and Andre Breton, as well as their American contemporary, the boxer Jack Johnson, the first African American heavyweight champion of the world. At the center of this story is a lesser known but fascinating performance artist, the Futurist Arthur Craven, who used fighting as performance art. In 1916, Craven challenged Jack Johnson to an exhibition fight. Dawkins has used this gloriously ridiculous historical gem to build a play about the growing pains of artistic movements and the meaning and nature of performance art. Conversations between ensemble members about the content and form of this devised piece have also become part of this very self-aware text. This includes candid discussion about race and casting in which the rest of the ensemble challenge Dawkins on his casting choices, especially his decision as the white guy and the show’s creator, to play Craven. The ensemble then negotiates, and renegotiates, among themselves over who gets to perform which role, and more importantly who gets to control the narrative. As the story unfolds the ensemble proceeds to school Dawkins on the true meaning of Dada. Things get meta, then extra-meta, then equal parts scary and smart. Woven in are moments of tenderness between Craven and his wife Mina Loy, a poet, playwright and along with Craven one of the original members of the Futurist movement. The show also highlights how Craven spent his life in the limelight though his wife was the more serious artist as well as the architect of his legacy through her biographical writings published after his death. Santiago’s powerhouse ensemble includes Trevor Dawkins, Jen Ellison, Rasell Holt, Arti Ishak, TJ Medel, Kendra Miller, Stephanie Shum and Jeff Trainor. All of them are mesmerizing to watch during the action sequences and all of them take turns leading the storytelling. With Seven Fights the company is taking stock of where it has been and where it is headed. Dawkins lets the audience in as the ensemble considers their core values as a company and debates what their aesthetic will be going forward. Will they perform as themselves? As characters? As themselves performing characters? The nuance of these distinctions are dramatized playfully, but with serious artistic consequences. In one of the most direct explorations a line of chalk is drawn. On one side Dawkins and Jen Ellison converse as themselves, but when they step across the line they begin step into performance rooted in self but blended with the trappings of character and theatricality (and maybe a slight homage to the chalk circle test in Brecht). All this stripping away of artifice culminates in a powerful moment of personal narrative storytelling when ensemble member Arti Isak stands up as herself to share a powerful real life experience of being “in the fight” in today’s America. 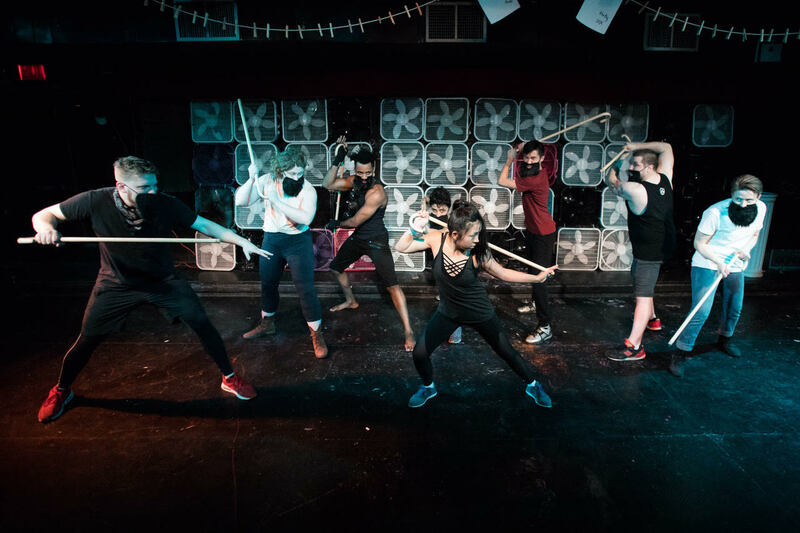 The fight choreography, designed by Gaby Labotka, and movement by Kendra Miller, are phenomenal. Additionally there is a list of fourteen people listed in the program as Fight Choreography Workshop Assistants. The movement is as much a part of the narrative here as text. As the title promises, the fights do tell ultimately tell the story, because it is after the fighting, the honesty and the airing of grievances that the ensemble comes together. The show closes with a celebration of the kind of trust that is built through working through discomfort and letting everyone have a voice, the end product of a successful artistic collaboration. A Story Told in Seven Fights is in equal measure entertaining and thought provoking. The Neo-Futurists are not only exploding form but also examining and questioning how theater gets made. BIAS ALERT: I’ve worked with Arti Ishak who has been involved as an actress in the development of three of my plays.